Hurricane Stan was a category 1 hurricane in the 2005 Atlantic hurricane season. 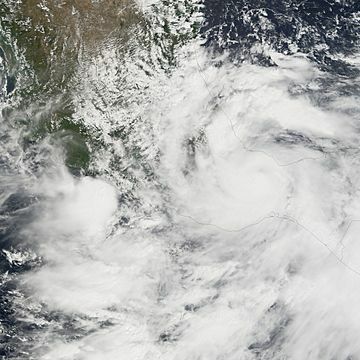 Hurricane Stan was the sixth of the seven storms in 2005 to make landfall in Mexico. The storm caused $1 Billion in Mexico and the Central American region. Hurricane Stan was either the deadliest or second deadliest of 2005 (or Hurricane Katrina). The exact number of deaths in unknown the number is at least 1,660 but could be up to 2,000. The name Stan was retired in the spring of 2006. It was replaced by Sean in 2011. Hurricane Stan Facts for Kids. Kiddle Encyclopedia.